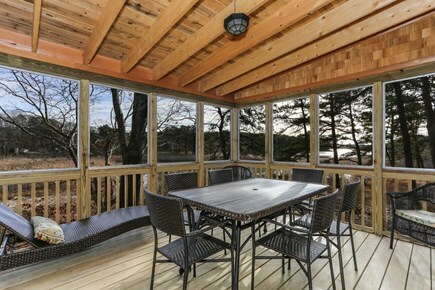 *Screened-in porch with dining table and deck with a new Weber gas grill. 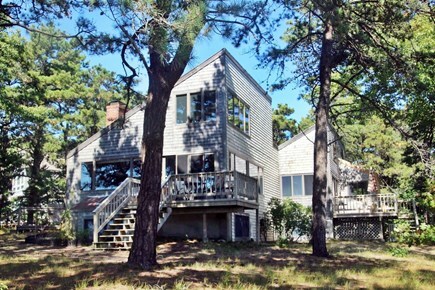 Welcome to Ruby's Point, located on the bay side of Wellfleet. This 2800 sq. 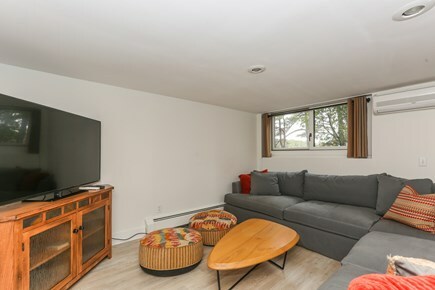 ft. bright, open contemporary sits on a private point at the end of a private way. 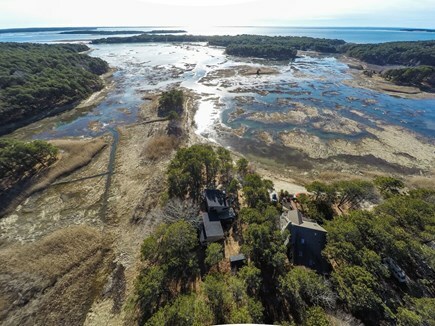 From almost every room you have a front row seat to watch the ever-changing views of a 65-acre salt marsh. Bring your camera or canvas. We’re less than a mile to Omaha or Burton Baker Beach and 1.3 miles to Indian Neck Beach, all on the bay side. The Wellfleet ocean beaches and Marconi Beach (part of the National Seashore) are within a 10-minute car ride. 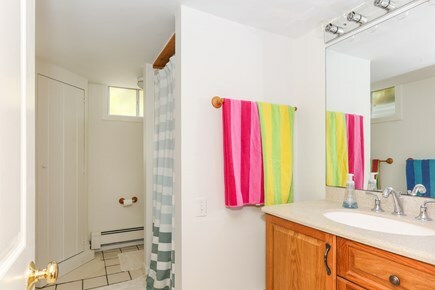 After a day at the beach, there’s an enclosed outdoor shower for rinsing off kids and dogs (we’re one of the rare dog-friendly rentals on the Cape). 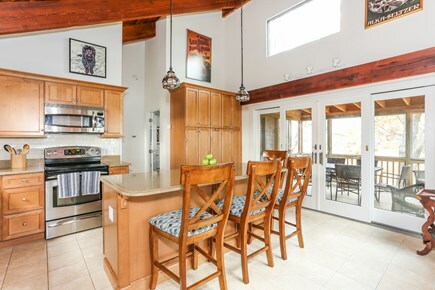 For entertaining, Ruby’s Point features a chef’s kitchen with stainless GE Profile and Miele appliances and a large island that seats six. 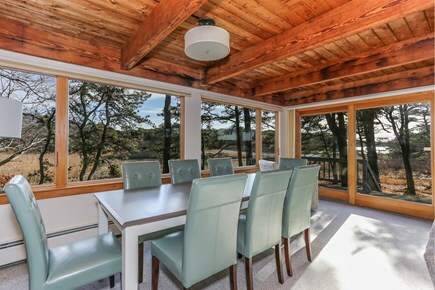 The kitchen opens to a screened-in porch with dining table. There’s also a deck with a new Weber gas grill. 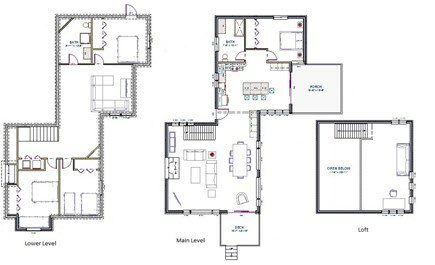 The house has a living room on the main floor and a family room on the lower level. Both have large-screen HDTVs with cable (over 140 channels). There’s high-speed WiFi and a brand new Sonos sound system with speakers in both the living room and kitchen. We have an office area in the loft, with a nine-foot down couch for reading, napping or quiet conversations. 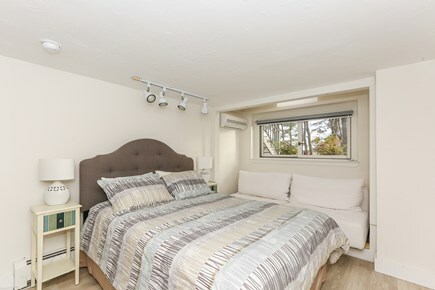 There are four bedrooms: a first floor master bedroom with a king bed; and three bedrooms on the lower level with queen beds (One of the queens has a twin size trundle). All four bedrooms and the family room have air conditioning. There are full baths on both levels. 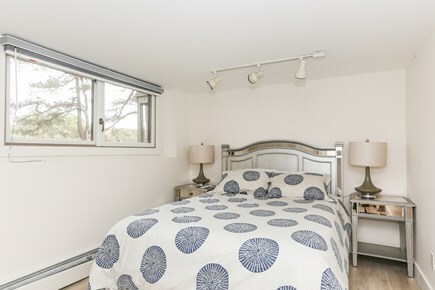 We are less than a 10-minute drive to the start of the Cape Cod Rail Trail, the Mass Audubon Wellfleet Bay Wildlife Center, the Chequessett Golf Course and Yacht Club, several tennis clubs, hiking and kayaking, and, of course, the famous spring-fed swimming and boating 'ponds'. 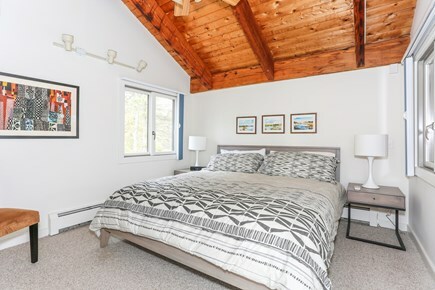 Ruby’s Point is available for Sunday-to-Sunday weekly rentals during the high season of summer and 4-night minimum rentals the rest of the year. We welcome well-behaved dogs with vigilant owners. Additional availability info: Seven night minimum from 6/3/18-9/1/18 Four night minimum off season. This is a Sunday to Sunday vacation rental. Additional pricing info: Cleaning fee $275 Pet fee $200 Refundable Damage Deposit $500, State and local taxes of 12.45% will apply. 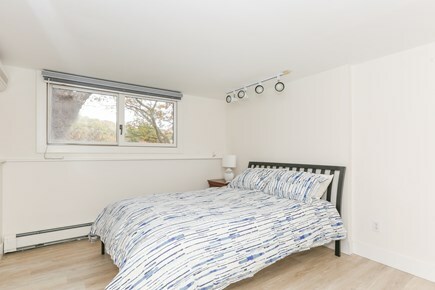 The master bedroom is on the main floor of the home and can be accessed if a wheelchair can be moved up and down the few stairs in the front of the home. The main bathroom shower has a seat for easy bathing. Hi! We’re Tracy and Paul Cassidy, and we’re the new owners of 65 Vanessa's Way. Our family has been vacationing in Wellfleet for over a decade, and we adore the town and everything about the area. When we first set eyes on this beautiful house, we knew right away that it was a special place – a peaceful retreat in a town we’ve loved for many years. We want to make your visit to Wellfleet and the Cape as wonderful as possible. 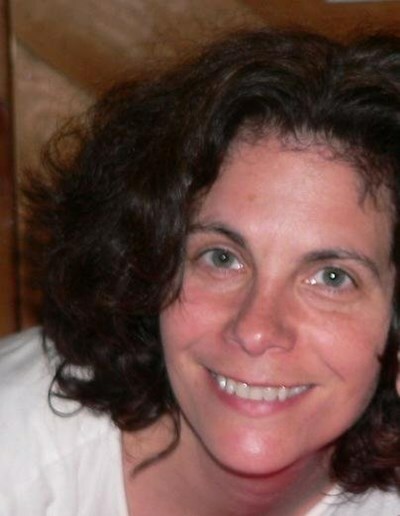 Here’s some information about us: Tracy was a certified public accountant before she left the workforce to raise her two boys (now grown and in college). Paul works in IT in Boston. He's an avid cyclist, and he hopes you’ll enjoy the many places to explore around Wellfleet. Tracy loves to garden, so you’re going to see some beautiful new plantings over time at 65 Vanessa’s Way. 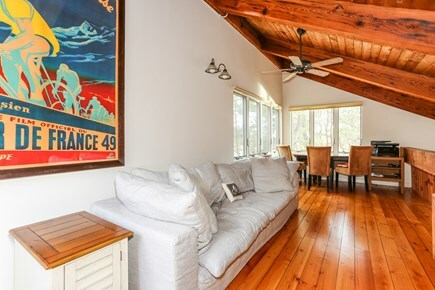 We love dogs, so this is a rare dog-friendly rental on the Cape. If you have any questions before your vacation, please don’t hesitate to contact us. At the end of a long unpaved private way sits Ruby's Point. From almost every window of the house the tidal marsh and its ever changing views are visible. 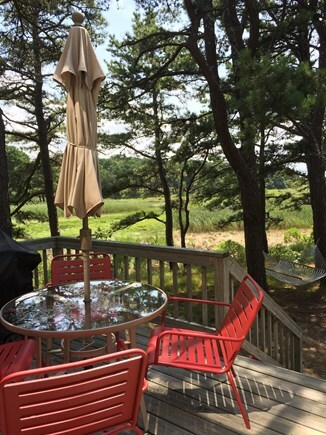 Have coffee on the front deck and watch the sun rise and later relax in new Adirondack chairs to watch it set as it crosses over the marsh. At night watch a star show above the darkness of the marsh. Inside the house, gather with your family and friends in to eat, play games or just hang out in the screened in porch off the kitchen. Or sit in a chair and birdwatch from the living room through huge picture windows (we leave a pair of binoculars there just to check out the wildlife). When you come home from one of the several nearby ocean or bay beaches (or the ponds! 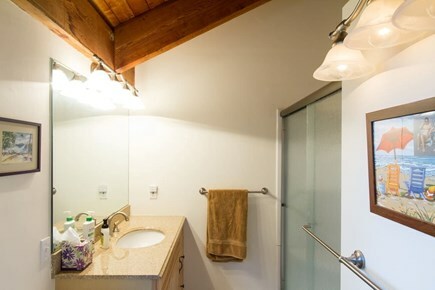 ), rinse off in the large outdoor shower (there's even a ''window'' there to see the view! 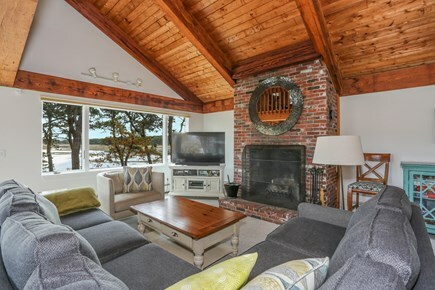 Take the family to the Wellfleet Drive-In or watch a movie on TV in the lower level den together. 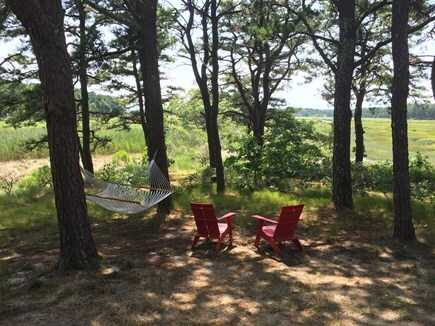 The house is so close to everything - the town, the beaches, the ponds, the bike path, the Audubon Wildlife Sanctuary, Provincetown and the rest of the Outer Cape and yet such a peaceful relaxing retreat. It's the best of so many different worlds. When we decided to buy a house there was no question that we would buy anywhere but Wellfleet. After over ten years of vacationing here we're still exploring it and loving it and now, living it. The kettle ponds are great for our young nephew, who takes swimming lessons offered by the town each summer. We love the Wellfleet ocean beaches, where we can bring our dogs (early am and late pm), have beach fires, skimboard, boogie board, fly kites and so much more. We love the bay beaches where the sun sets over the bay, the water is calmer for smaller bodies and the low tides offer endless exploring opportunities. The kids love the Wellfleet Drive-In and the mini-golf and the bike trail. We love the connection to nature, whether it's a visit to the Audubon Wildlife Sanctuary or the many hikes and trails - many that start right at our front door. We also love the town itself where we go to eat, shop, walk and eat some more (especially the ice cream). Still need more ideas? 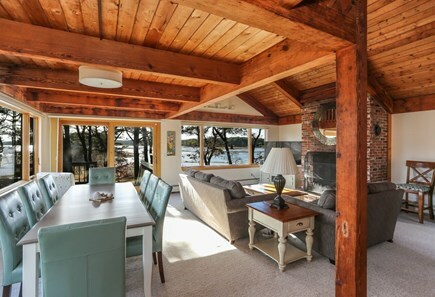 Rent a kayak from Jack's, take surf lessons from Sickday, enjoy a reggae gig at the Beachcomber or see a show performed by WHAT (Wellfleet Harbor Actors Theater).